Bathroom Organisation Hacks for Busy Families - Home Sorted! The bathroom. We use it every day, but do you ever take time to consider how organised it is? Probably not. 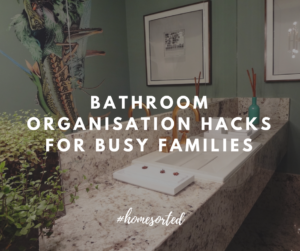 For this reason, we’ve grouped together our top organisation hacks to ensure even the busiest of families can have a perfectly sorted bathroom. Jars are fantastic and versatile for bathroom storage. They can be used to store small items such as cotton balls or cotton buds. But you can also use them without their lids to keep items like toothbrushes, toothpaste, and make up brushes in order. Better yet, when they get grimy they’re easily washed or replaced with new jars straight from the kitchen! The bathroom and/or toilet are generally small and cramped. For this reason, we strongly recommend investing in some vertical storage to save space and increase your storage options. A great example is an over the toilet shelving unit. You can use these shelves to store spare toilet rolls, towels, and face washers. They’re particularly great if you’re lacking a spacious linen cupboard. Does your family have a tendency to dump dirty clothes on the bathroom floor and walk away? Replace this attitude by keeping a washing basket in the bathroom. This way there’s no excuse not to put dirty clothes in the basket when removing them. Think drawer dividers are just for the kitchen? Think again. These are amazing at keeping bathroom drawers sorted and streamlined. Consider designating a section to each family member as a way to differentiate between the owners of different products. No one likes to untangle messy hairdryer cords. Avoid this by installing a couple of hooks on your bathroom wall or beside your bathroom cabinet (just remember to check that there is a power point nearby) to hang up frequently used electricals. This tip is particularly great for heat styling tools like hair dryers and straighteners that need time to cool down. If you have toxic or dangerous goods in your bathroom, be sure to store these out of reach for small humans. We recommend keeping any medicines on the top shelf in your bathroom cabinet. If this spot is not high enough, consider investing in a lockable box or storing them elsewhere.